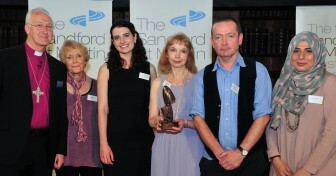 We are delighted that A Mother’s Good Friday: Diane Foley, our podcast featuring the mother of US journalist James Foley, who was murdered by ISIS in 2014, has won the Sandford St Martin Trust’s inaugural Interview of the Year award. Our 2015 Good Friday edition brought the passion story right into the 21st century, with a present-day mother who has had to endure the knowledge that her son was in danger of execution, and then had to learn to live with his very public and brutal killing. Talking to Mark Dowd, Diane Foley reflects on why, even though she never spoke to Jim again after his capture, she knew her son was close to her in prayer. She explains how the experience has helped her understand Mary far more deeply, and why she has been able to forgive “Jihadi John”, her son’s unrepentant killer. The Sandford St Martin awards are regarded as the UK’s most prestigious broadcast awards for radio, TV and online content that explores religious, spiritual or ethical themes. You can still listen to the full podcast here.